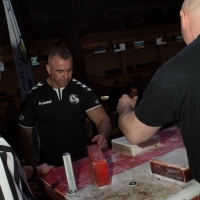 In April, giving an interview to Ryan Bowen, an Australian arm-wrestling video-blogger, Dave made it clear that his short-term and long-term goals are related to one thing - to defeat Andrei Pushkar and, thus, to achieve the first position in the world professional arm-wrestling. What are his chances of achieving this result? Dave's fight with Dmitry Trubin at Vendetta All Stars 2017, where Dave won the Intercontinental PAL belt in a brilliant fight, showed that the American athlete is very close to his goal. Of course, Dmitry attributes his loss to an old injury, and, of course, it played a role, but, nevertheless, the form in which he went to the duel seemed to guarantee him victory over any opponent. But Dave Chaffee thought differently. From the outside, Chaffee's victory looked powerful and fast. And the easiest way was to explain it by Dmitry’s trauma. But, in fact, behind it stood Dave's very serious preparation plus his fighting nature. After the match, Dave opened that this victory costed him 4 months of work only over his endurance. Unlike in the US, in Europe there is not much known about Dave . He admits that he is not a very public guy. But even what is known is enough to ensure that no one doubts that he belongs to the elite of the world arm-wrestling. His victory over Denis Tsyplenkov alone says a lot. "Give me Pushkar! I want to fight with Pushkar! "- he repeated. At Vendetta ALL Stars, Dave will meet with a very strong opponent, multiple world and European champion, Genadi Kvikvinia. By strength and speed Genadi can make a serious competition for Dave Chaffee, although being the "dark horse" of the tournament. During negotiations with PAL, Dave did not hide his dissatisfaction with the choice of the organizers. "Give me Pushkar! I want to fight with Pushkar! "- he repeated. But Igor Mazurenko, president of PAL and promoter of Vendetta, grounded this choice of the opponent, first of all by the fact that Dave, after a break, returned to the PAL arena only in 2017. And let his return was brilliant, Andrei Pushkar during the last few years was moving according to his own plan. And on the jubilee Vendetta, Andrew will have to storm his next peak - to fight Denis Tsyplenkov. If Dave wins Genadi Kvikvinia, his match with Andrei in 2019 will be inevitable. Last Sunday, the Armbets News team interviewed Dave Chaffee and the material is being prepared for release. And we will continue the story about this outstanding athlete next week. Do not miss!